AQUA consolidates, streamlines, and empowers you with modules that include everything you’ve been asking for! AQUA’s latest modules further consolidate and streamline tasks by organizing all related activities into single modules that provide easy-to-use tools and robust functionality. AQUA builds on the success of previous versions with even more of what you’ve been asking for. AQUA is full of new features, but we're highlighting the ones that will impact you the most. 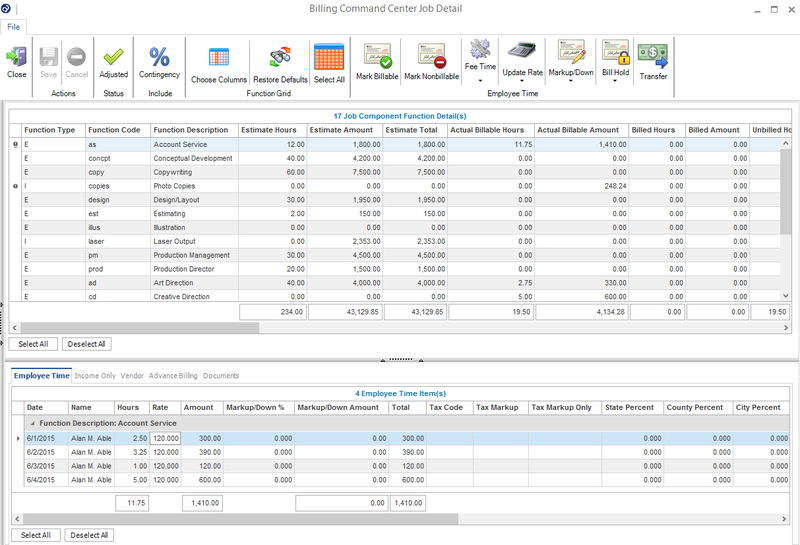 The Billing Command Center consolidates everything related to billing and adds dozens of new features and tools all designed to expedite billing and create accurate reports. Create multiple billing batches to manage different billing groups. Define your view by selecting from a large number of column options on every page. View media order and production job summary estimate, cost and billing info. View production job function and item detail including more billing approval information. Take actions at the production job level including transfers, bill hold, and reconciliation. View billing history by invoice and related backup documents for every job. Drill down to the function and item level detail on every job and take actions directly. Manage advance billing and income recognition records. Transfer time, costs and income records by job, function or item. Adjust individual records on a simple excel-like grid using new tools that adjust all records at once using methods you select. Update rates and flags retroactively and automatically. Markup or markdown time records by approved, estimated, billed or set amounts. 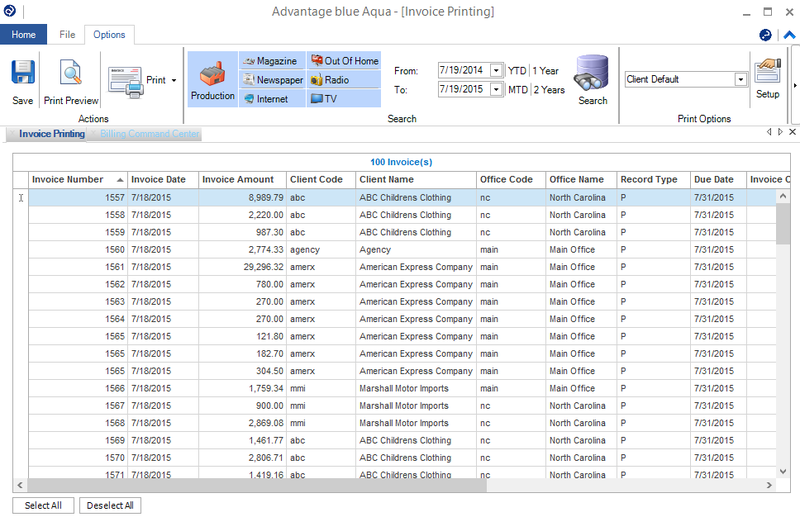 View and even edit comments that will appear on the client’s invoice. Export billing records and produce billing reports. Invoice Printing satisfies every client need and saves you time with the addition of more formatting and information automation tools! Create and save your own invoice templates so you can control field placement, label names, layout, margins, hard-coded wording, and more, all using the power of the Advantage Report Writer. Choose from dozens of built-in formatting options to design both standard and custom formats. Save your formats by Agency or Client so they can be printed or electronically delivered with one click, automatically. In addition to existing contact options, you can add a contact to every invoice. View and edit invoice and other related comments easily. As your invoices are printed, a PDF is saved to the document manager. Related back up such as vendor invoices and expense receipts can be gathered and bundled for electronic delivery to your clients. 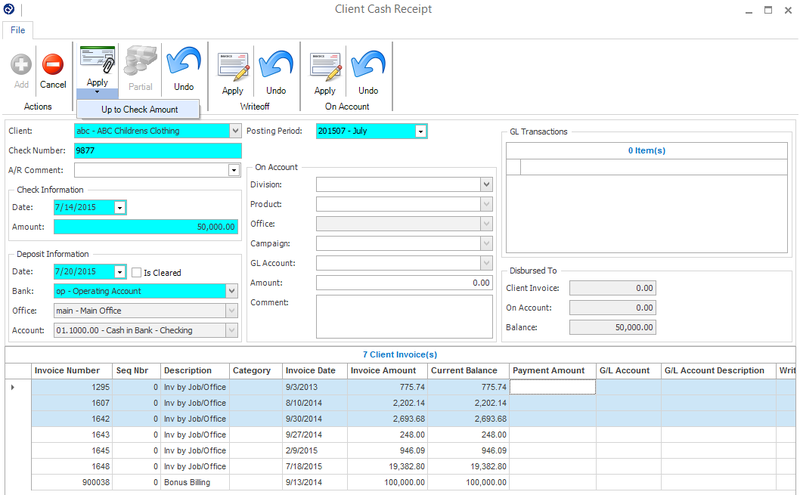 Client Cash Receipts brings more single-click actions and ease-of-use for ultimate efficiency. Apply checks, apply write offs, and apply on account with single click action. See everything on a single screen for a quick view of the entire check and how it is applied. Apply partial payments by job or media order for more precise ‘paid by client’ reporting. Ability to import cash receipt records. Estimate Printing is even more flexible with the addition of more formatting and print options! 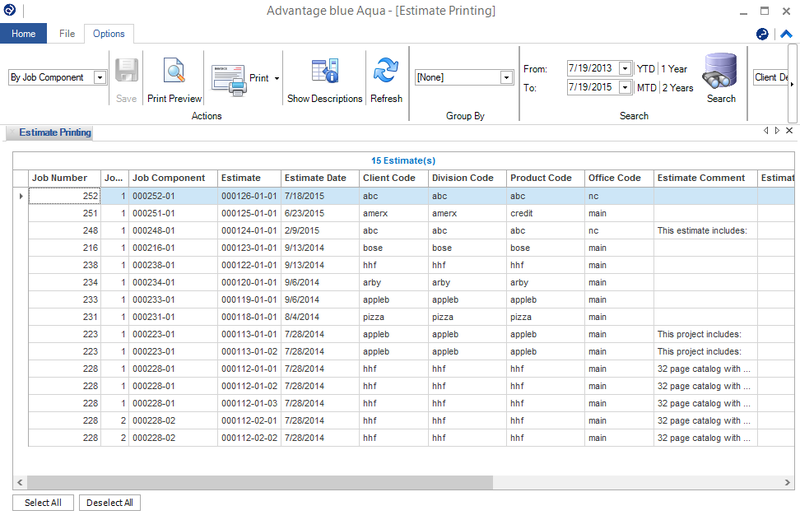 Create and save your own estimate templates so you can control field placement, label names, layout, margins, hard-coded wording, and more, all using the power of the Advantage Report Writer. Save your formats by Agency, Client, Product and User. You can access and update the estimate contact from the print module. View and edit estimate comments easily. Want your agency to increase profits and decrease headaches?